For the Batley Bulldogs rugby league player, see Francis Maloney (rugby league). Francis Thomas Maloney (March 31, 1894 – January 16, 1945) was a U.S. Representative from Connecticut from 1933 to 1935 and a U.S. Senator from Connecticut from 1935 to 1945. He was a Democrat. Maloney was born in Meriden, New Haven County, Connecticut, March 31, 1894. He was a Catholic and his father and maternal grandparents were from Ireland. He attended public and parochial schools of Meriden. From 1914 to 1921, he worked as a newspaper reporter, except for 1917–1918, when he served as a seaman first class in the US Navy during the First World War. He then engaged in real estate and insurance business. 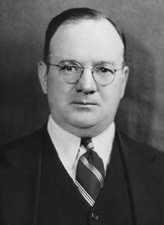 Maloney served as mayor of Meriden from 1929 to 1933. He was elected as a Democrat to the U.S. House of Representatives of the seventy-third Congress and served from March 4, 1933 to January 3, 1935, in the session that was shorter than the usual two years because the time when the sessions would open was changed. He did not seek reelection, because he had been nominated for the Senate. He was elected to the Senate in 1934, re-elected in 1940 and served until his death in 1945. He was chairman of the Committee on Public Buildings and Grounds in the seventy-seventh through seventy-ninth Congresses. Maloney was a delegate to the Democratic National Convention from Connecticut in 1936, 1940, and 1944. He died in Meriden, Connecticut, on January 16, 1945, and was interred in Sacred Heart Cemetery. One of the two public high schools in Meriden, Connecticut, is named for Maloney. ^ The Political Graveyard, Index to Politicians: Maloney. ^ Maloney, Francis Thomas at the Biographical Directory of the United States Congress. ^ Maloney, Francis Thomas at the Biographical Directory of the United States Congress. This time frame is, however, noted as 1930-1933 at The Political Graveyard. ^ Cf. Francis T. Maloney High School.